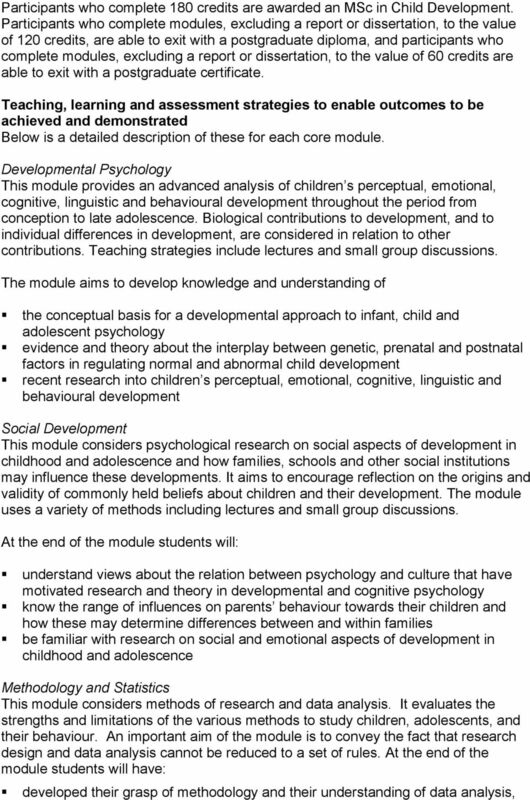 Download "PROGRAMME SPECIFICATION MSc in Child Development. 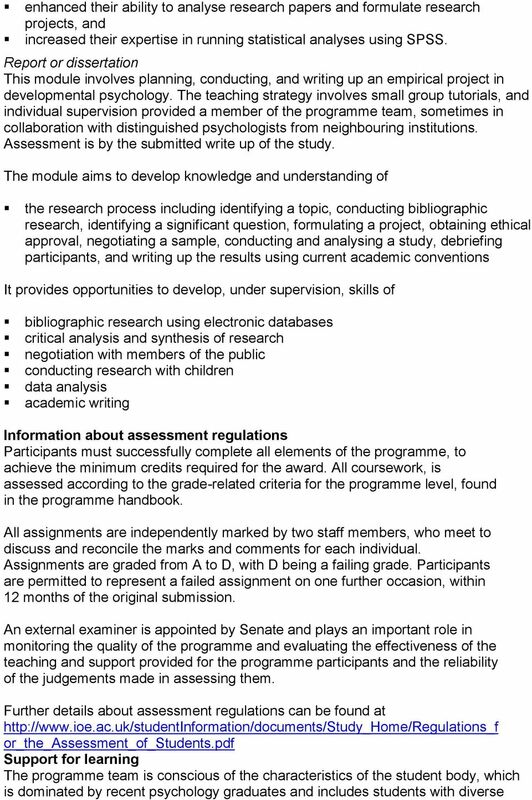 Awarding body: University College London. 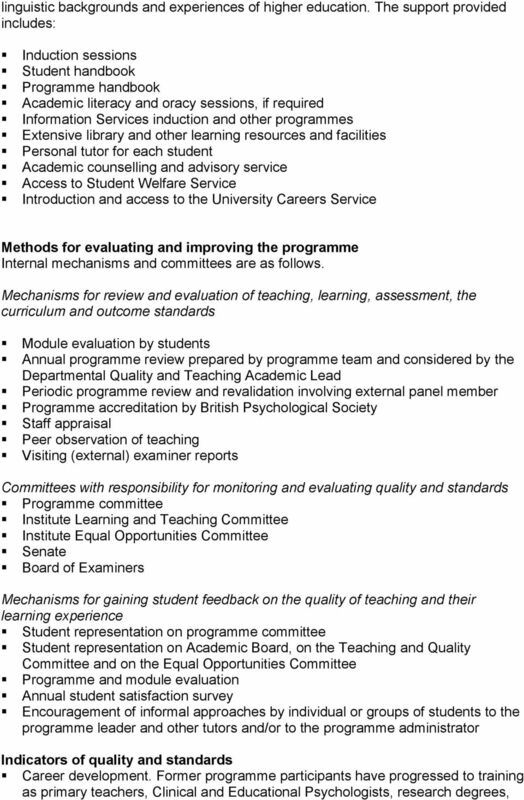 Teaching Institution: UCL Institute of Education"
1 PROGRAMME SPECIFICATION MSc in Child Development Awarding body: University College London Teaching Institution: UCL Institute of Education Details of accreditation by a professional/statutory body The British Psychological Society recognises this programme (when it includes the Atypical Development module) in combination with the Graduate Certificate in Psychology as giving eligibility for the Graduate Basis for Chartered Membership (previously known as Graduate Basis for Registration) Name of final award Master of Science (MSc) Postgraduate Diploma Postgraduate Certificate Programme title Child Development UKPASS code: P Language of study The Institute of Education teaches and assesses participants through the medium of the English Language. Competence in English is required of all applicants. Programme regulations may indicate the level of competence required for each applicant and may make its achievement a condition of admission. 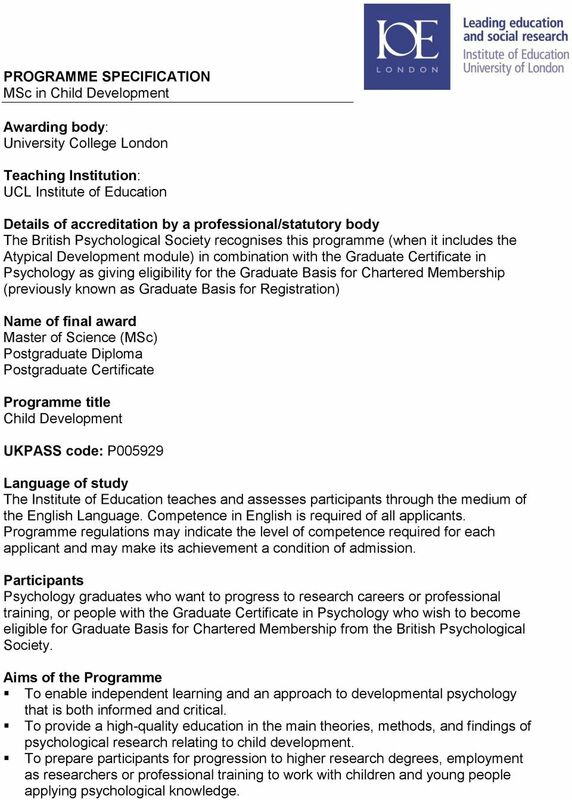 Participants Psychology graduates who want to progress to research careers or professional training, or people with the Graduate Certificate in Psychology who wish to become eligible for Graduate Basis for Chartered Membership from the British Psychological Society. Aims of the Programme To enable independent learning and an approach to developmental psychology that is both informed and critical. To provide a high-quality education in the main theories, methods, and findings of psychological research relating to child development. To prepare participants for progression to higher research degrees, employment as researchers or professional training to work with children and young people applying psychological knowledge. 2 Programme Outcomes Successful students demonstrate the abilities to develop critical and informed arguments about significant issues in developmental psychology analyse research papers in terms of their theoretical and empirical contributions (both from the viewpoint of adequacy and novelty of methods and significance of results) understand the role of statistical tests and modelling in the testing and development of hypotheses and theories conduct a study which offers a contribution to the literature within the framework of postgraduate research. These abilities are developed through the core modules of the programme: Developmental Psychology, Social Development, Methodology and Statistics, and a Report or Dissertation. 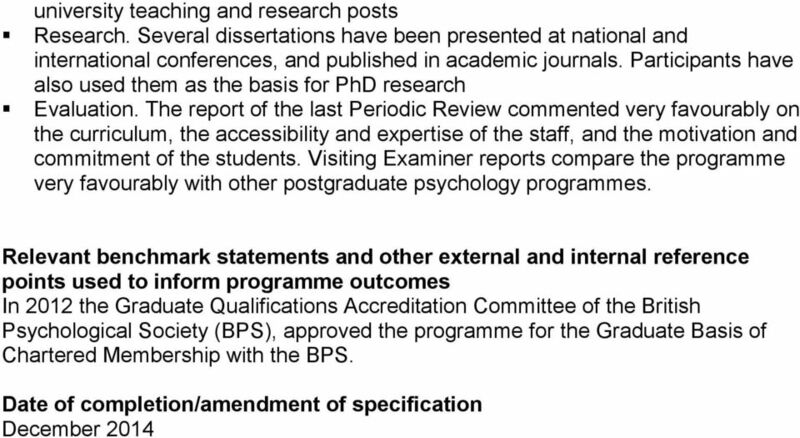 Criteria for admission to the programme Applicants not seeking Graduate Basis for Chartered Membership (GBC) with the British Psychological Society are eligible for admission if they have a good honours degree or graduate equivalent qualification with at least 30% psychology and satisfactory academic references. Applicants who do not fulfil this prerequisite may be required to pass qualifying assessments or take the Graduate Certificate in Psychology prior to joining the programme. 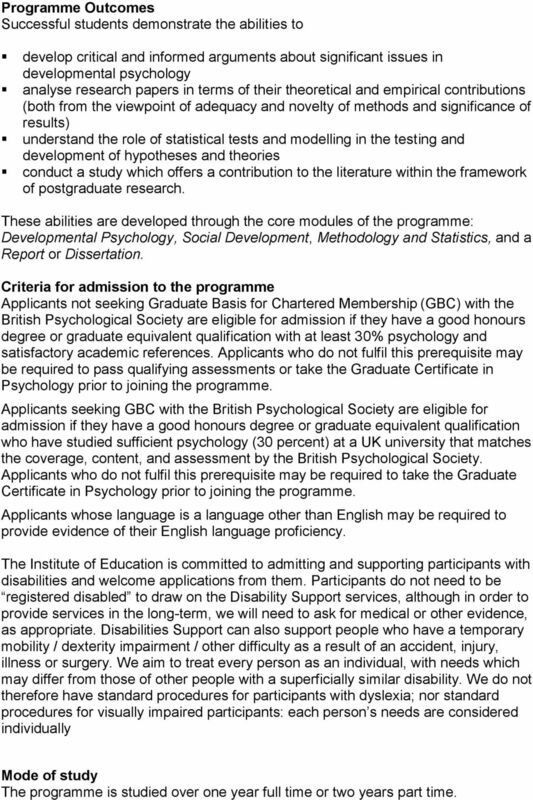 Applicants seeking GBC with the British Psychological Society are eligible for admission if they have a good honours degree or graduate equivalent qualification who have studied sufficient psychology (30 percent) at a UK university that matches the coverage, content, and assessment by the British Psychological Society. Applicants who do not fulfil this prerequisite may be required to take the Graduate Certificate in Psychology prior to joining the programme. Applicants whose language is a language other than English may be required to provide evidence of their English language proficiency. The Institute of Education is committed to admitting and supporting participants with disabilities and welcome applications from them. Participants do not need to be registered disabled to draw on the Disability Support services, although in order to provide services in the long-term, we will need to ask for medical or other evidence, as appropriate. Disabilities Support can also support people who have a temporary mobility / dexterity impairment / other difficulty as a result of an accident, injury, illness or surgery. We aim to treat every person as an individual, with needs which may differ from those of other people with a superficially similar disability. We do not therefore have standard procedures for participants with dyslexia; nor standard procedures for visually impaired participants: each person s needs are considered individually Mode of study The programme is studied over one year full time or two years part time. 3 All students start in the Autumn term. Part-time students attend on Thursdays in their first year and Mondays in their second year. Students who choose to take the report module rather than the dissertation will be required to choose an additional option module. Code Module Attendance Assessment Credits Autumn MMACDV_01 Developmental Psychology Spring MMACDV_06 Social Development Thursdays (10 weeks) Mondays (10 weeks) Autumn and Spring MMAPSY_23 Methodology and Statistics Spring MMACDV_08 Atypical Development Spring MMASEN_08 Language Development Autumn, Spring, and Summer Autumn, Spring, and Summer Thursdays or (10 weeks in the autumn term)+ Thursdays or (4 weeks in the spring term) Thursdays (10 weeks) Tuesdays (10 weeks) MMACDV_98 Report Individual tutorials by arrangement MMACDV_99 Dissertation Individual tutorials by arrangement Report 30 Dissertation 60 Programme structures and requirements, levels, modules, credits and awards The Institute of Education uses the European Credit Transfer and Accumulation System (ECTS), as a guide to support periods of study undertaken abroad and to assist student mobility. Currently it is assumed that two UK credits equate to one ECTS. 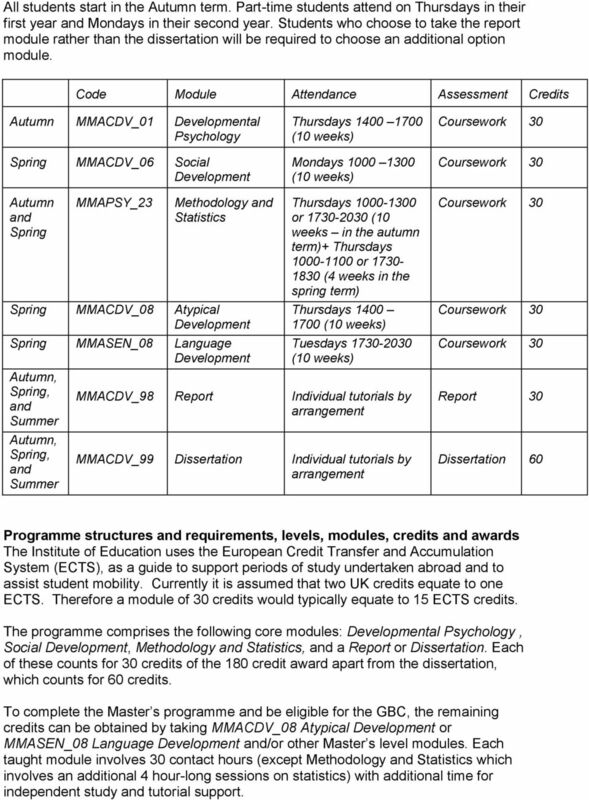 Therefore a module of 30 credits would typically equate to 15 ECTS credits. The programme comprises the following core modules: Developmental Psychology, Social Development, Methodology and Statistics, and a Report or Dissertation. Each of these counts for 30 credits of the 180 credit award apart from the dissertation, which counts for 60 credits. To complete the Master s programme and be eligible for the GBC, the remaining credits can be obtained by taking MMACDV_08 Atypical Development or MMASEN_08 Language Development and/or other Master s level modules. Each taught module involves 30 contact hours (except Methodology and Statistics which involves an additional 4 hour-long sessions on statistics) with additional time for independent study and tutorial support. Participants Teachers and other education professionals concerned with mathematics education from all phases of schooling.